Believe it or not, summer’s just around the corner! Our week-long School of Rock Summer Camps have been voted a Colorado Parent Magazine Family Favorite for the past four years, and School of Rock Denver is back for 2019 with a series of terrific camps for students of all ages and experience levels! 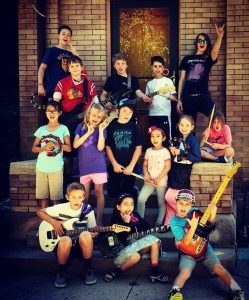 For the beginners, we have two sessions of Rock 101 Camp, which will take them through the basics of playing in a band, including rehearsal and stage etiquette, finding your sound within the group, stage presence and much more. Our Led Zeppelin Camp is back by popular demand, featuring a wide selection of the legendary band’s greatest songs, along with our Best of the 90s Camp, which will explore the advent of the Grunge and Alternative genres! And our Electronic Music Production Camp is a great way for kids to learn about Digital Audio Workstations, Sound Design and Audio Production in a fun and collaborative setting! For camp details, including full descriptions, sessions dates and signup, please visit our online portal by clicking on the link below. Sign up before April 15th and receive 15% off tuition!